Madison McKinley is an undergraduate student majoring in Marketing in the Eli Broad School of Business at Michigan State University. Amazon (SYMBOL: AMZN) is the largest internet-based retailer in the U.S. The company is a leader in finding ways to expand into new consumer retail markets. One of Amazon's newest market forays is in the personal assistant market, utilizing Alexa, its artificial intelligence system, to drive sales of their new home personal assistant device called Echo. Echo is a wireless speaker that is controlled by the sound of your voice and works by allowing you to talk to Alexa. The built-in capabilities of Alexa are referred to as skills. Adjusting the thermostat, turning on and off lights, playing music, setting reminders, news updates, listening to audio books, and ordering items off of Amazon are just a few of the thousands of skills that Alexa can perform through Echo. When it comes to artificial intelligence, Amazon is competing with Google Assistant (SYMBOL: GOOG), Microsoft's Cortana (SYMBOL: MSFT), and Apple's Siri (SYMBOL: AAPL). However, Amazon was the first to release a device utilizing artificial intelligence to create a home personal assistant with Echo in 2014. It wasn't until 2016 before Google came out with Google Home, giving Amazon close to a two year head start. With that, Echo has more skills than Google Home and it links better with other devices/apps, giving Echo a significant advantage. Also, Google Home currently can only handle one Google account. "The company has been called the "accidental" early winner in the voice-controlled home, leading Google, Apple and others - including Microsoft, as of this week - with surprisingly strong sales of Echo and other Alexa-enabled devices that play music, answer queries, control smart home devices, play games with users, set timers, and much more." Amazon's biggest competitive advantage most likely comes from its business strategy to work with third party developers. This greatly increased the number of skills that Alexa performs, like calling Uber from the Echo device. They have also been working with other companies to put the Alexa software in some of their products and services. By incorporating Alexa into other products, Amazon will be able to solidify Echo's dominance in the personal assistant market. In order to keep building upon Echo's already large amount of skills, Amazon has a $100 million fund called "The Alexa Fund." With this money, the fund can invest in companies who want to enhance voice technology and artificial intelligence. This will keep innovation flowing toward Echo and Alexa, which will help enable Amazon to stay on top of this market. Amazon's Echo has already sold more than 5.1 million devices in the United States during the first two years of its release. According to Zacks Equity Research per the report from Gartner (04 October 2016), "consumer spending on virtual personal assistant-enabled wireless speakers would reach $2.1 billion worldwide in 2020, up from $360 million in 2015." It is estimated that Echo and Alexa could generate over $11 billion in revenue for Amazon, shown in Figure 1, with $4 billion estimated to come from the Echo device sales and $7 billion from commerce transactions associated with Echo. By creating the Echo device, Amazon will not only receive money from the sale of the device itself, but they will also boost the amount of purchases from their website due to the ease of ordering from Echo. "Echo owners spent around 10% more on Amazon after they bought the smart speaker. 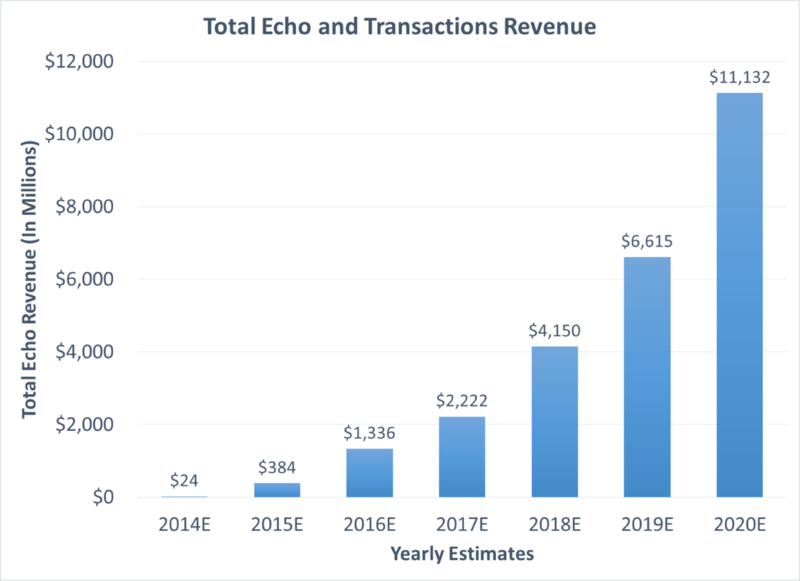 There was also a 6% increase in overall number of purchases made by Echo owners on Amazon.com, compared to the number before they purchased Echo. The study also revealed that 50% of the online spending by Echo owners happens on Amazon's e-commerce site (after they purchased the echo)." 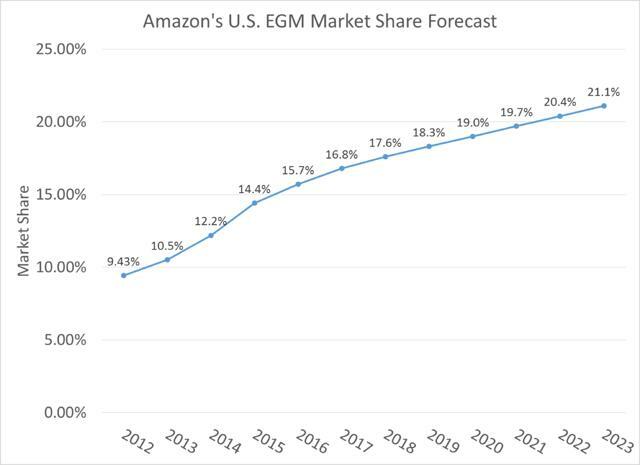 The forecast made of Amazon's U.S. Electronics and General Merchandise Market Share are shown below in Figure 2. The market share is expected to increase from 15.7% in 2016 to 21.1% in 2023. So the market innovation of Echo looks to increase Amazon's market share in its core business, and from this, profitability is likely to follow. The product and marketing investments made to create and to continually improve upon Alexa and the Echo device are a smart financial decision. This new platform has significant potential to increase Amazon's sales in its core business as well as generate sales in new market segments, which should greatly contribute to the company's growth and profitability. Amazon's 2016 first quarter earnings showed a net revenue of $29.1 billion, or a growth of 28% compared to their 2015 first quarter results.